The first shipping containers destined to be transformed into CARGO will land at Wapping Wharf today, August 10th. This will be the city’s first retail space made of converted shipping containers – and the area’s quickly making a name for itself as a new foodie hub for Bristol. Woky Ko – A 40-seater Asian restaurant and takeaway headed up by MasterChef finalist Larkin Cen of Cen at Celtic Manor, opening this September. Chicken Shed – a finger-lickin’ dine-in, dine-out chicken shop, opening in September, created by the team behind food festival Eat Drink Bristol Fashion, co-founded by Michelin-starred Bristol chef Josh Eggleton of The Pony & Trap, Amelia Twine, Nick Roberts and organic farmer Luke Hasell. BOX-E – Modern British seasonal cooking by award-winning chef Elliott Lidstone featuring a four-seat kitchen table for those who want to experience the buzz of the kitchen in full. PIGSTY – The first PIGSTY restaurant brought to you by the three brothers behind The Jolly Hog and Will Collier, current Harlequins player. Lovett Pies – artisan gourmet pies from the West Country from Lovett Pies’ first shop in Bristol. Bristol Cider Shop – Established cider shop complete with cider tastings. Corks of Cotham – Local wine, spirits and beer merchant opening its third site at CARGO. It will be the first Corks to offer a bar for customers. The Mighty Quinns Flower Emporium – Independent florist, stylist and event specialist. Opening its first retail unit at CARGO. Shambarber – Famed Stoke Croft barbershop will be opening its second venue, offering styling for all. They’ll add to the existing retailers currently open along Gaol Ferry Steps, namely Mokoko, Better Food and the Wild Beer Co, along with Pizzarova who have a pop-up crate on-site. It won’t be long until Little Victories and Bertha’s Pizza open too. 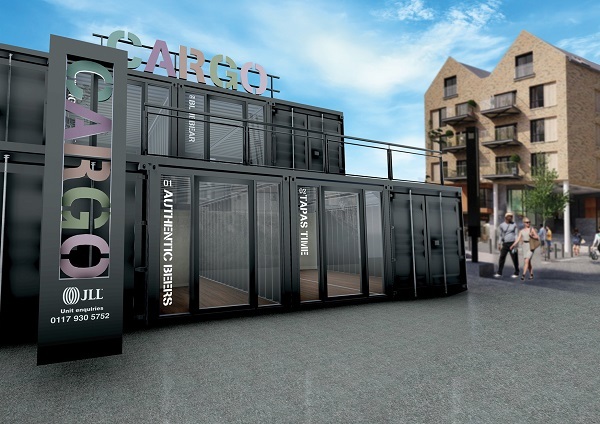 CARGO 1 features 18 converted shipping containers, while CARGO 2 will consist of 28 such units. Many of the units have glass frontages and look out over the water, with some even having outdoor terraces. It’s expected the the first retailers for CARGO 1 will open this September, while CARGO 2 will be later this autumn.